Hope you have bookmarked, and continue to follow us! I shared some exciting information last week, I hope you hop on over, and see what's going on! Blogging will return to normal... soon. :) I'm enjoying our summer, even if it's just lazy days. If I'm on the computer trying to formulate a blog post, I'm taking time away from my kids and my husband. I refuse to be on the computer, more than what I have to these days. By the way, thanks for the emails. :) I'm still here and read them. I don't blog about our daily lives, so when I do blog, I try to have it with a lot of content. The special word is "try" - LOL. So, it takes me a bit longer, than to throw words together about what we did that day. School starts the end of the month, so we are down to the last few weeks of summer. I will be back with updates, soon! Updates on my new blog site - YAY! Got a domain, moved everything over. I just haven't played with it much, yet. One quick update, no news on Gavin's gene - yet. Hopefully when I post again, I will have some more news to share. It's 11am, and we are still in PJ's. Boys went night swimming last night, and I have yet to pick up breakfast dishes. Oh summer... I love you. PS - Enjoy your kids. Who loves science? I'm a closet science freak. I love the science channel, books, pictures, and all that is galaxies and solar systems. My mind often wanders to the enormous size of what exists in our universe, and kind of really gets to me. I subscribe to many science newsletters, and this particular email I received really got me thinking. It was titled "How Big is the Biggest Star in the Universe?" Of course, this title alone gave me heart palputations, and I needed a glass of wine drink of water. I couldn't read it fast enough, scanning the text for the size. 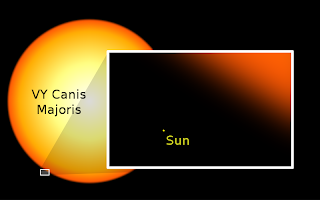 The size of this star (VY Canis Majoris) being almost 5,000 light years away, and over 2,100 times the size of our sun. Over two thousand times that of the sun! How can you even imagine that? I have always said not being able to share scenic pictures of nature and the world with Gavin, is what can instantly bring me to some heavy sighs. Yes, he will see it differently, but the visual beauty is what I am talking about. Especially when I gaze to the heavens on a clear night in the desert. Instantly, as with much of science when I read about the realm which exists outside of our galaxy, I am reminded how we are just a speck of dust in all that exists. You would think we, as humans, would unite and align ourselves in a way which bans together the human race. How did I go from talking about my nerdy star to my philosphy of life? I'm not quite sure. What I do know is, I am tired of the lack of focus at times from some of my fellow my fellow humans, with whom we share the same planet, sun, air and water. Speaking of outer space, maybe if the world were put on high alert, and attacked from some type of Extra Terrestial beings, the world would unite and be one. Maybe? The political parties constantly fighting and bickering, would stop. People not having respect for our President (walk a mile in his shoes), regardless of what your political party subscription may be, would end. It's amazing that some people think that there is not a human behind that title. Those who religiously practice their faith (or not), but yet are so quick to judge and criticize, would cease. Those who bully one another, attacks against one another based solely on your sexual preference, surface judgements based on how fat, thin, ugly, charming, happy, sad, poor, rich, or how much money you make (that you spend), would stop. These are some of the conversations that make up what we discuss (by we, I mean me as well), and yet, in all that is important, our existence is something much more than what we can humanly comprehend. I cannot begin to understand the power of ALL that is life, and that extends to the depths of the ocean, to the darkness of the galaxy. We are at the mercy of our own mortality, we live life breath to breath (thank you Ronnie Dunn). We focus so much of where we want to be, who we want to be, than right now. Now is what is guaranteed. This very breath. Yet, we tend to fill those breaths with ugliness, hatred, criticism and persecution. We are a speck of dust, figuratively speaking! A very important, smart, soul bearing speck, but a speck nonetheless. We are so small, yet so powerful and yet we tend to focus on not being cohesive with our existence as humans. Raising children keeps you on your toes, and knowing that the home environment is shaping and molding the center of who my kids are... puts some weight on your shoulders. The more I try to explain (especially to my very bright 7 year old), and keep my eye on what is important, the more I feel I am exposed to the negative that exists. Hence my little rant. Can't we just be the human race, and be thankful we exist and that we are here? See what science does to me. Am I just cranky and old? Back to my star. Who would have thought VY Canis Majoris would bring so much clarity, and prompt a blog post. Thank you gigantor star, again I am reminded of what is important, just by trying to imagine the sheer size of what you are, versus the size of me. "Individually we are one drop. Together we are an ocean"
Disclaimer: I respect opinions, I don't expect everyone to agree, it's what makes us great. Life is hectic! Is that an understatement? With obligations every weekend, baseball, and all the other life details that consume our everyday, I will try to do a blog post this week, but no guarantees. Exploring a new business venture, and having to put quality time into the book - makes blogging with real content, difficult. It comes after family time, and even that can be scarce these days with our busy life. A post will happen, just not sure when. I'm here, just super duper busy. A really quick thank you to those who replied and emailed me about the "25% chance" blog post. It's interesting, and I agree with all of you on all different levels! Since you were all so honest, I need to be as well. This is something that has made us think about more children. We always wanted 4 (for sure 3). Being a carrier for LCA had made us rethink everything, especially because we don't know if Gavins gene provides the chance for kidney problems/failure. We are still holding the baby card in our hand. Just not sure how it's going to be played. Many of you know we lost our last pregnancy, and it's been a year, and still as many of you know, it's difficult. Adding LCA to the mix has made it even moreso. Both my kids fulfill my life, but as with many of you expressed who are LCA parents, it's difficult to see things your child has to endure. Making sure the special needs are met, is time consuming as well. I would never want one child to feel as if they are not getting as much attention. The list goes on, and it's so nice to know how many families/mothers I can relate to! Ok, back to the craziness. First up, to unpack from our little weekend spring trip to San Clemente. How can 4 people have so much laundry? I vote on disposable clothing. PS - Anyone want to vote on something else? I deserve mom of the century! Landon has yet to have his laser tag party for his birthday. His birthday was in March. Let's hope we get it in before Christmas. Gavin has been "riding" his scooter at Blind Children's Learning Center, for a few weeks now. The thing is, he has to be in the mood to explore, since it does require the skill to really keep your balance. When we first started working with the scooter, he didn't even want to hear it. We moved to touching it. Then he began playing with the wheels, and turned it upside down. A few weeks later, we played a game with it, where we began to push it back and forth. Then it was fun! He began asking to play with the scooter (which meant pushing it back and forth to Joan). That was such an accomplishment. Today, Gavin gets on and off like nothing. However, it is still a work in progress, as you can see he doesn't like to be on it for too long. He will get up on the scooter board, all by himself, and get down, all by himself. At times he wants to get right off, but then Joan plays with him, and tells him "Let's go see mommy", and they scoot over to me, and I tickle his feet. He laughs, and we can do this a few times. Seeing his progress, and the new things he is doing, each week, is so encouraging. It all takes time, especially for someone like Gavin, where he really needs to get an understanding of something before he is comfortable. Then he moves to mastering it. He makes strides chunks at a time. All in his own time! I love watching him succeed. A video and some news! Tour De Sight from Blend Media Solutions on Vimeo. Please check out the above video! It shows the incredible energy from our mud runs at Irvine Lake! It is our promo video for our upcoming Tour de Sight journey in 2012 – where we will be cycling coast to coast for a cure for LCA!. When you’re done, hop on over to Gavin’s Groupies blog, and check out the latest news that’s going on with two of our very own Groupies.